Saves money. This is one I realize more, especially now that Charis is VERY interested in the potty. My daughter knows when she has gone pee; she gets a look on her face and starts walking with her legs straddled, but she has not yet figured out she needs to pee before she actually does it. So, I constantly have to change her every 30-120 minutes. I'm putting 8-12 clean diapers on her per day. They're convenient. I don't have to ask Drew to stop at Target at 9:30 PM as he's coming home from work to get disposable diapers because we're on our last diaper and need more before we wake up. I can reuse the diapers on future children we may have. I've also lent diapers to family and friends who are considering cloth diapers. If we don't have more children, they will be sold and given away. I'm not filling a landfill with cloth diapers. They're good conversation starters. Yes, I was THAT person at Babies"R"Us who told the couple about Greenberries, the local consignment store that sells Thirsties, Flips, Fuzzibunz, Grovia, Green Mountain prefolds and fitted diapers, etc. I can coordinate costumes with her diapers. Last year when Chick-fil-A were giving a meal away if you came dressed like a cow. Charis dressed like a cow down to her diaper. The only thing that did not have a cow print on were her sandals. I cloth diaper for the cute factor for sure! I just love them and I'm THAT person too :) I talk about them all the time. Oh how I wish I had a cloth diaper consignment store near me. Wait...do I really? I would be in so much trouble! 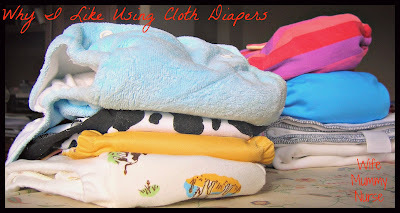 I used cloth diapers which were second hand from a friend and I have now passed them on to another mom. They were so easy to use and were machine washable. I liked them for pretty much the same reason as you have stated except for the 'coordinating' as mine where plain white with white covers and I have two boys so they always has pants or shorts over them. i think you posted a picture of her wearing the cow print?? or was it chana?? love your post sarah!! I have two in diapers and using cloth is definitely saving us money. And my son has very sensitive skin and disposables were always giving him harsh chemical rashes. But with cloth he doesn't.